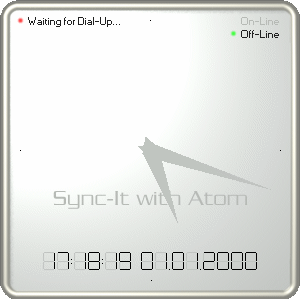 Sync-It with Atom was a simple tool for keeping your system time accurate. It worked on Windows XP and older versions, but is no longer needed as similar functionality was introduced in the operating system starting from Windows Vista. If you are still using Windows XP or older, you should seriously considering upgrading to a newer operating system for security reasons. If you are unable to upgrade to a newer version of Windows, try one of the many Linux distributions, such as Ubuntu. You can still download a copy of the program from the download page. If you have problems installing Sync-It with Atom or when using it, please read the help file and the Frequently Asked Questions. Copyright © 1999-2003 Sami Tolvanen. All rights reserved.